Christmas House Tours - filled with tons of truly unique decorating ideas! Shake the snow off your boots and pick up a glass of glogg (or coffee, or hot chocolate, or wine). Remember my Christmas house tour last year? Well, I hope this tops it! Welcome to my holiday house tour, the next stop after the fabulous Beth of Home Stories A to Z. Thanks Jennifer Rizzo for including me in this week long tour of 20 houses decked for the holidays. I raided my mom in laws attic this year and found the most amazing treasures like my hubs cute little shovel. My marshmallow wreath is back and made it through a year of storage. so my snowy mason jar candles are scattered throughout the house. Who needs a window treatment when you can have this! I’m loving all things white this year and this is such a fun centerpiece. Even my mantel is decked out in white but poor Santa will have a tough time filling our stockings this year. Antique stocking stretchers found at Brimfield. White spray paint on branches – now they look like birch trees. 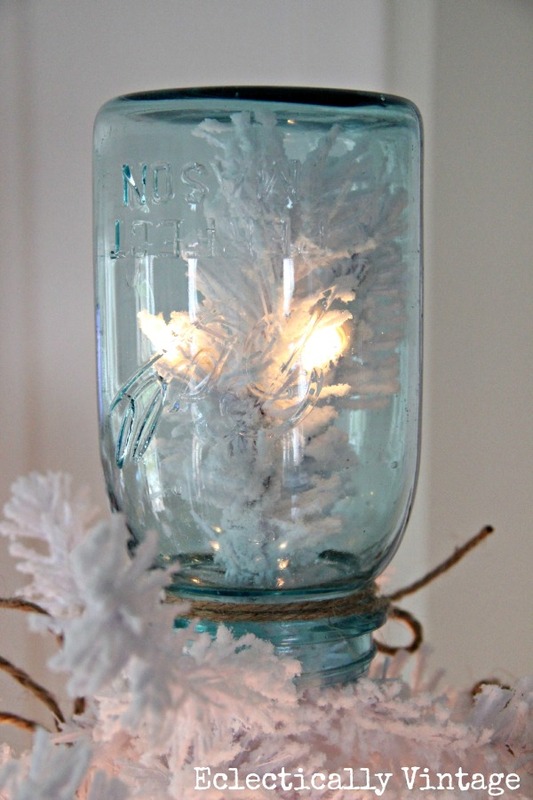 No angel on my kitchen tree – I just flipped an old mason jar over for a unique tree topper. 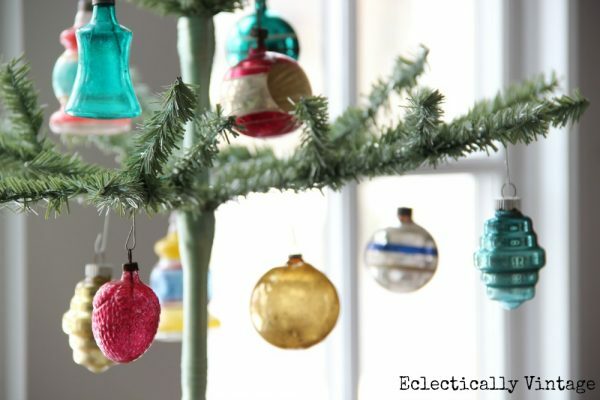 Vintage shiny brites get noticed on feather trees. Mrs. Claus has nothing on my vintage dress form. Tree topper tuned lamp topper. Boxwood clippings from my yard win the prize. Isn’t a pony on everyone’s Christmas list? make sure to stop by the next home – it’s a surprise – on the House Walk! So click the Stop 7 pic below to see who it is and check out her amazing house all gussied up for the holidays. Like my Christmas house tour? Then be sure to check out my Christmas house last year – equally amazing I hope! 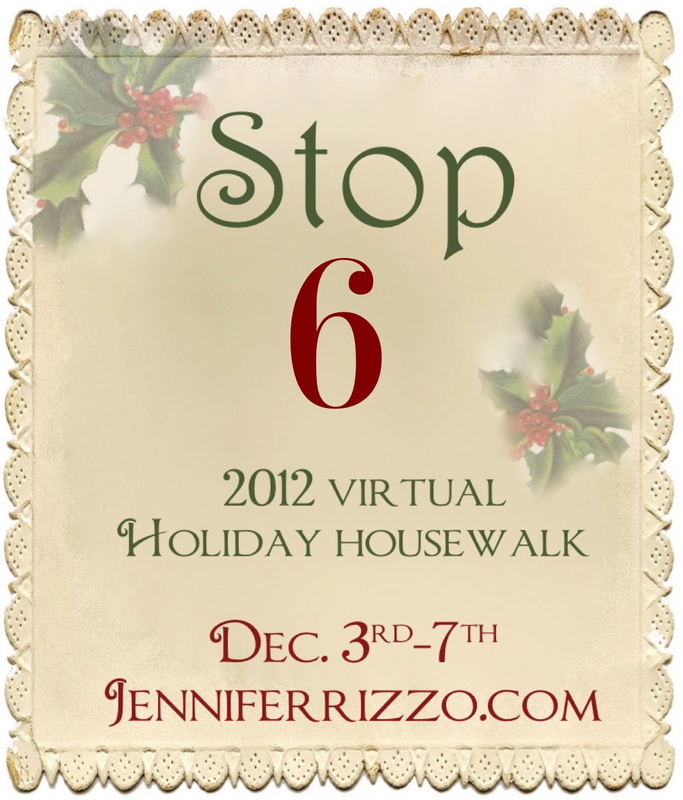 To see all of the gorgeous homes (starting from the beginning) on the 2012 House Walk, stop by Jennifer Rizzo‘s. Beautiful, Kelly! I always love your vintage elements… they make your decor so unique and special. I love the shovel hanging on the door! My favorite part was the vintage typewriter. So festive in its own way. Love it all, Kelly. I use to have a peddle car, too. AMAZING!!! oh that shovel…… i want it!!!!!! Absolutely gorgeous Kelly!! I’m heading over now … will just keep my eye out for that Fabulous shovel!! Love all of your husbands vintage finds! I guess you know how lucky you are!!! I love it all!!!!! Merry Christmas! Thanks for the tour, cheers! Kelly- here’s to a beautiful home and Tiffany’s!! Love it all. Have a wonderful holiday season. Gorgeous!!! Everything is perfect- love love love it! Love your husband’s old pedal car, the dress form, the shovel, the carousel horse. The mantel and trees were fun too. wow, so many great things in your decor, my fave just has to be the dress form all blinged up for the Holidays!! You and Beth have those great typewriters! 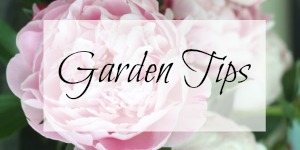 Love all your decor – so many pretty things! Kelly it’s wonderful. So full of the holiday spirit. You are so creative. Happy Holidays. Everything looks so pretty & festive Kelly!! 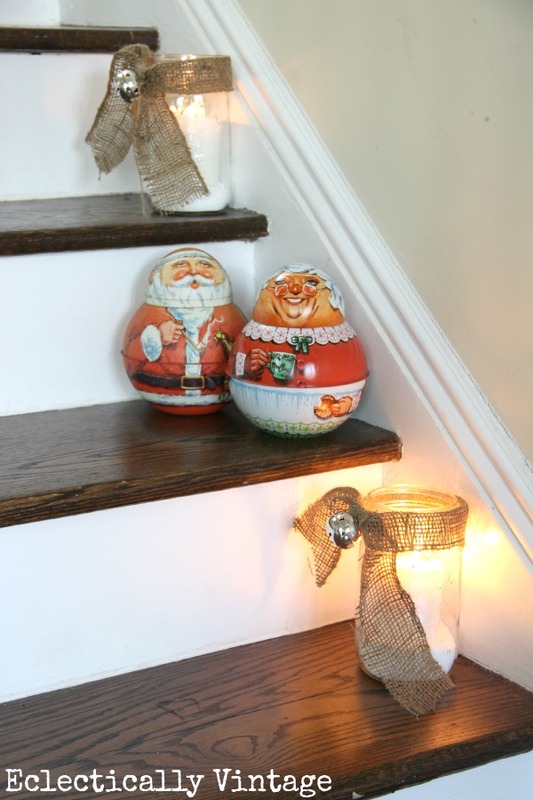 I love how unique your Christmas decor is!! That old fire truck is the coolest! I love all your vintage touches Kelly! There is so much inspiration in these photos. Love everything, but especially that fire truck! Amazing! Oh, and the branch with the vintage ornaments – and the typewriter!!! Beautiful! I love each decoration and would love to try this next year. OMG, this is tooooo cute! I just love the shovel, firetruck and vintage horse! You have displayed them wonderfully, i can tell that every room in your house is full of charm and character. Thoroughly enjoyed the tour Kelly! 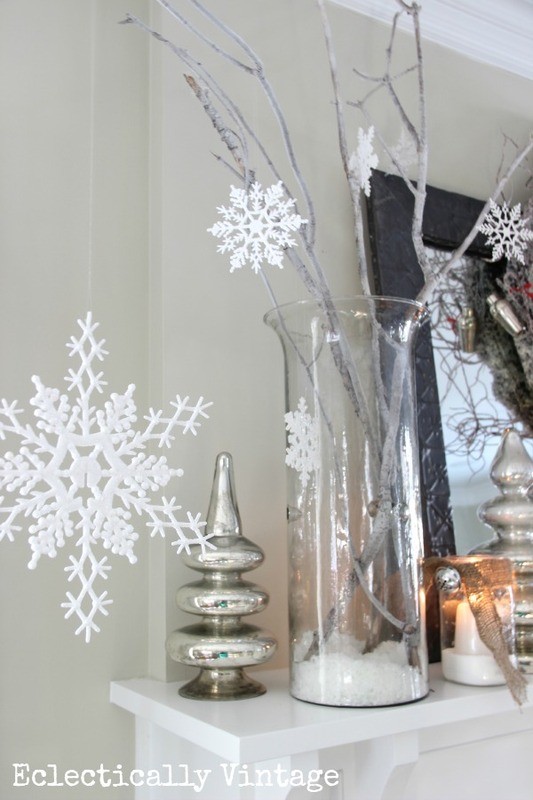 The title of your blog suits your decor perfectly, even at Christmas!! You have the most unique decorations. I love the branch hanging above the window with ornments on it. 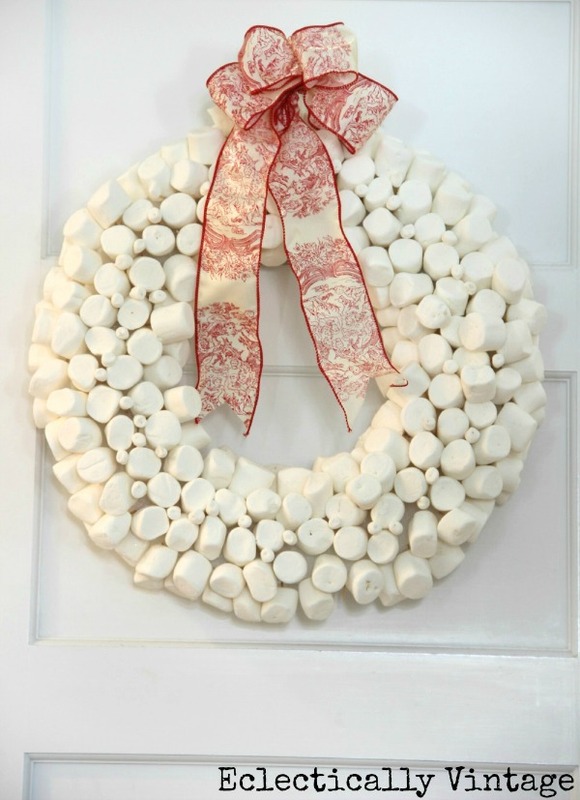 The marshmellow wreath is so clever too. The feather trees are so great! I could go on and on. What a fun house! Well that all looks very lovely. 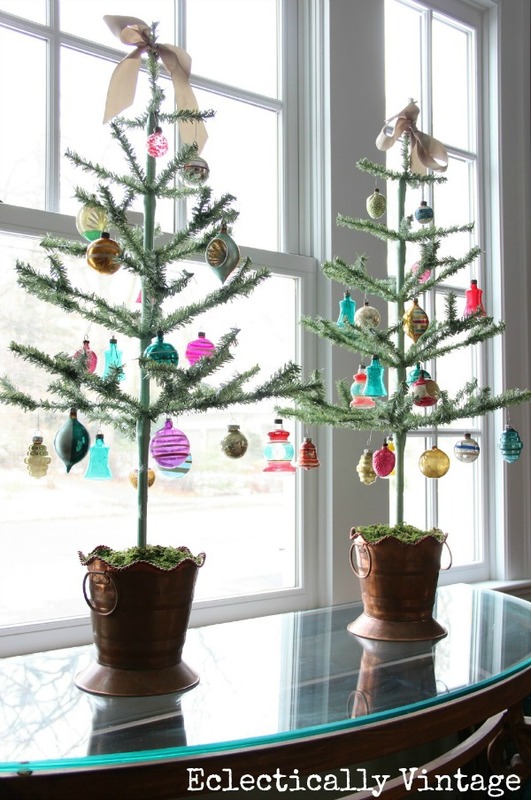 I especially like the vintage trees on the glass table. Looks like my house. Do you collect glass ornaments? I have been for years. Love them to pieces. Those little trees are so brilliant for showcasing the best ones. I love every. single. detail! I too have a sap bucket with a rosemary plant…great minds??? Gorgeous!!! Kelly! I love all of this! That pedal car is SO CUTE with the tree in the back. How adorable that it was your husband’s. I’m in awe that a marshmallow tree can survive for a year in storage. Someone should tell that to those Doomsday people. This is my kind of Christmas decorating. What you don’t see everywhere else. I love every bit of it. Somehow I missed that Marshmallow wreath last year! That cute wagon is to die for!! My favorite though is your dress form with the ornaments hanging from it. For some reason, it just delights me! What do you call someone who comes and steals another persons whole Christmas not because they don’t want Christmas to happen like the Grinch, but because they want to put every last thing in their own house? That’s me. I’m gonna find the best figgy pudding recipe I can. I will leave it for you when I come to fetch everything. Keep a close eye on that Fire car my friend, It would be the perfect place to hold our Fire Christmas Tree … I love your home Kelly, just stunning! LOVE LOVE LOVE the branch with ornaments over the window. So cute! I love that car with the tree! Your decorations are amazing! I love every detail! Wonderful, wonderful tour! 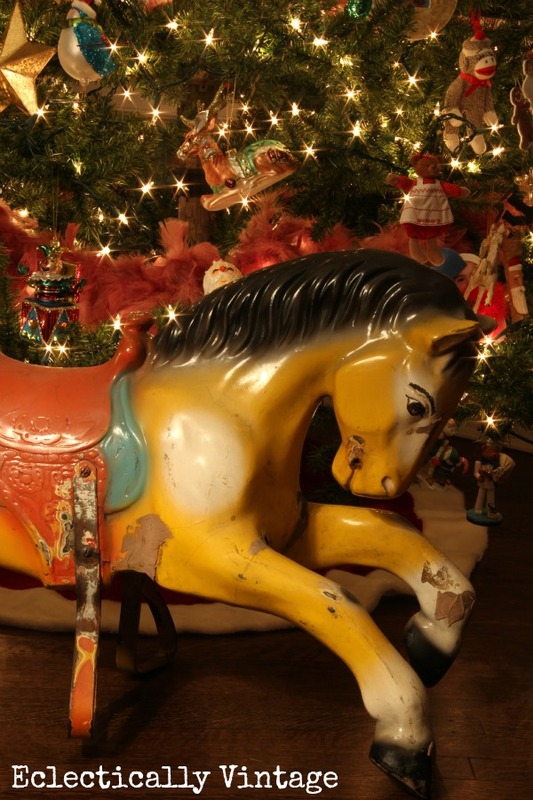 Kelly, you have THE most amazing vintage Christmas home … ever! I absolutely LOVE your hubs’ little car (such a fabulous focal point and conversation piece). 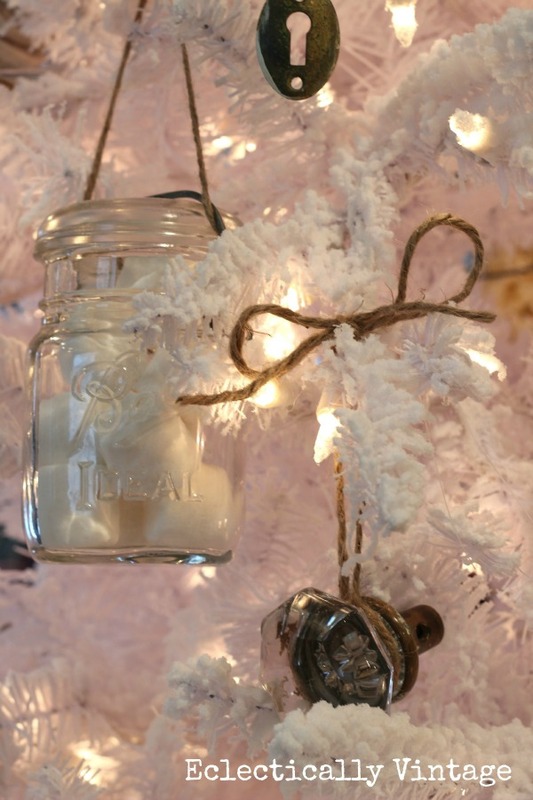 Your incredible mantel … the mason jar filled tree … your handcrafted ornaments. Wow. Thanks so much for sharing! Oh this made me smile ear to ear. You truly live up to your blog name with all the eclectic touches! They are adorable! Kelly, your Christmas home is so delightful… and what about that peddle car!! You are the Queen of Eclectic. Kelly, You have outdone yourself! Everything is gorgeous and I just love the firetruck and the pony. Your home is just gorgeous I love every detail. Thanks for letting us pop in for a peek. Your husband may have flash backs on Christmas morning and except a new bicycle or something! Love your cute decor. I think my favorite is that red pedal car though. Couldn’t be any more perfect for Christmas! BTW, I have your typewriter’s Grandfather in my entryway this year. How lucky you were to have some of your husband’s old “stuff”. P.S. What is glogg? egg nog + ? Your Christmas decorations are gorgeous! I could look at your pictures over and over! Kelly it all looks INCREDIBLE!!! Can you hear me shouting at you? 😉 I absolutely love all of your perfectly eclectic vintage touches and your fireplace should be on the cover of a magazine!! LOVE all of your unique Christmas touches Kelly!!! Your home is BEAUTIFUL!!! 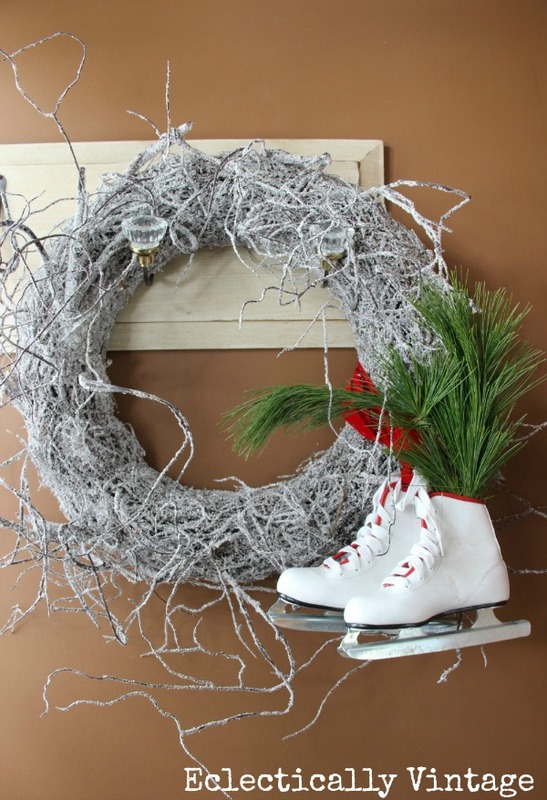 Love everything…especially the mantel…but can’t get over the cool car decked out for the holidays…it’s the bomb! Wow! So many creative ideas! Those stockings are awesome! Beautiful, as expected. I can’t believe your marshmallow wreath was in storage for a year, looks fresh. I was going to say how all of the vintage toys and playthings were my favorite part…..aaaaaaaaannd then came the typewriter. BRILLIANT! Your house looks absolutely amazing. I so enjoyed the toured of your Christmas house, Kelly! Wonderful touches everywhere. Give your MIL a thank you from all of us for saving the treasures from your hubby’s childhood. We got to enjoy them too! 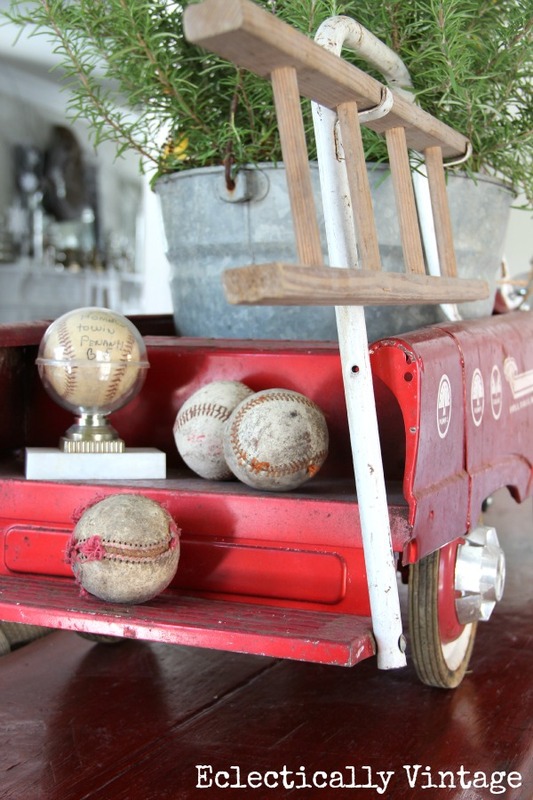 The vintage red car with the galvanized bucket in it is my favorite.. Your home is beautiful and I love the mason jar tree topper.. 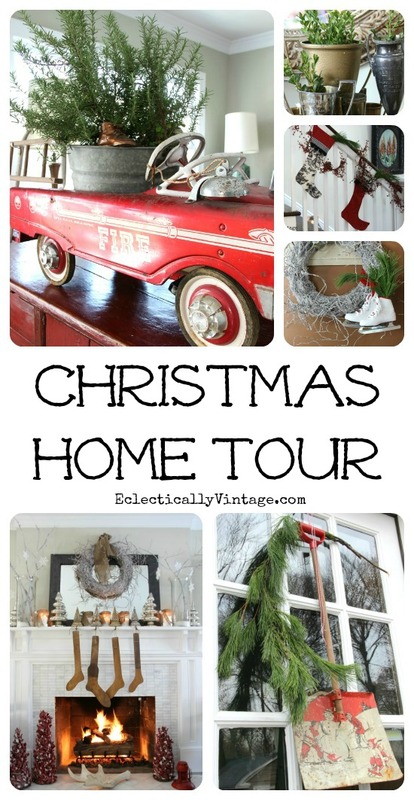 Your holiday home tour is amazing! I love the vintage pieces from your husband’s childhood .. cannot believe that the infamous marshmallow wreath survived (I’m seriously shocked!) 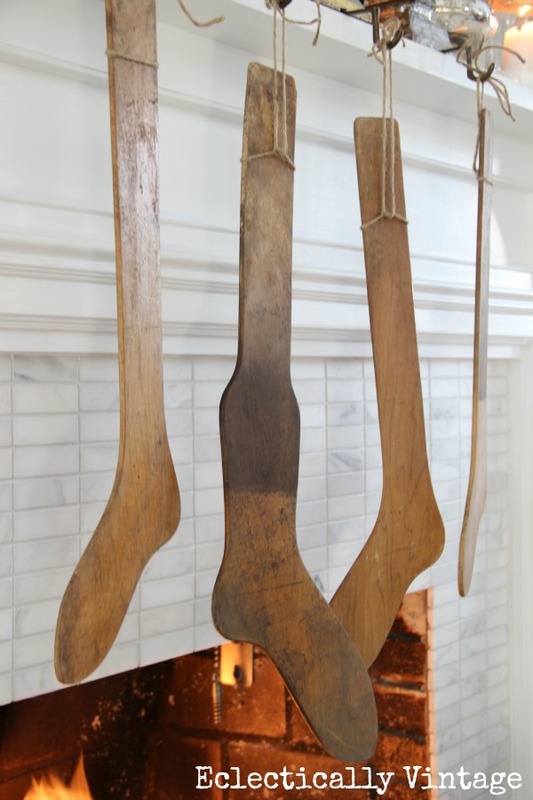 … and those stocking stretchers are my all time favorite. Hands down! So, when does the ladder xmas tree go up? everything is so cute, love it all! your home has such great touches. I am so glad you were apart of the tour! I love it Kelly! 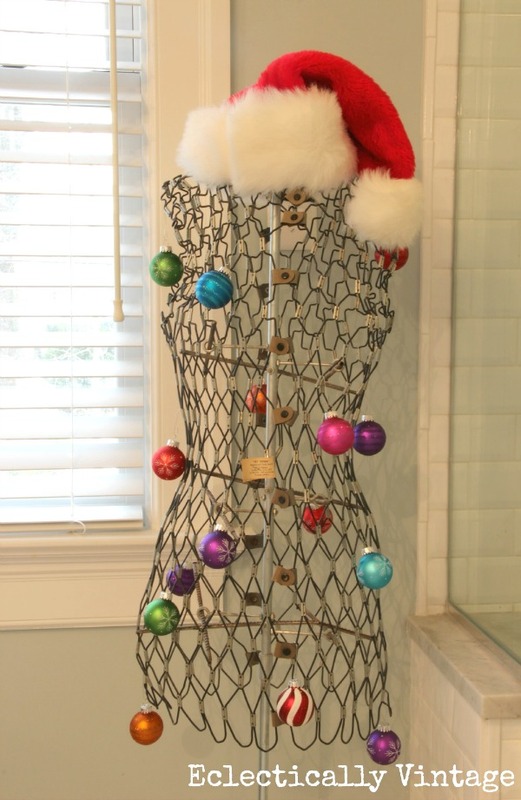 You are so creative with your decorations, like the tape measure star and ornaments on the dress form! 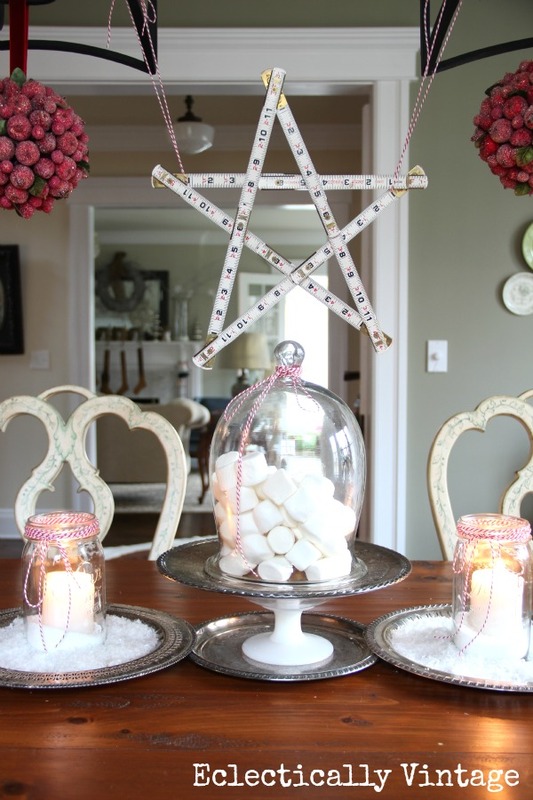 what fabulous decorations….how nice to have all those childhood goodies saved…I loved the star over the table made from the old tape…..
You are a true creative genius! I so enjoyed the tour and loved seeing all of your unique touches! 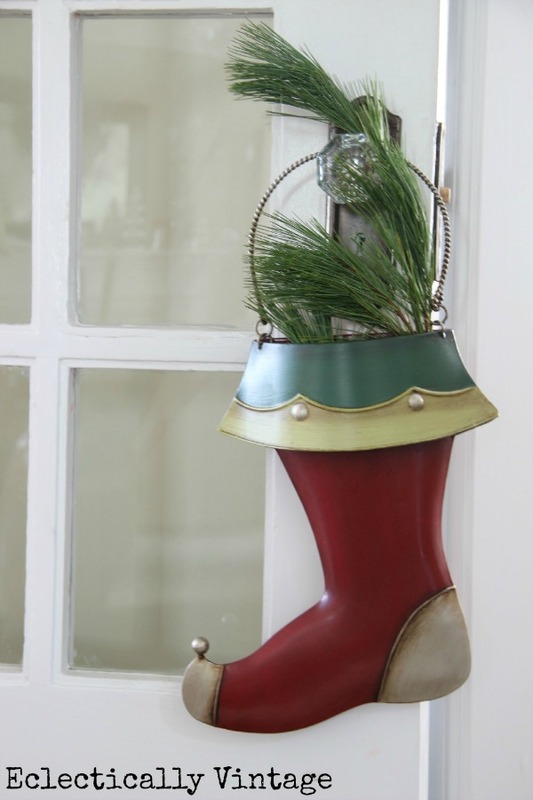 The stocking are my favorite….it was so hard to choose! Well done!! Well done! Kelly, your home is AMAZING with so many unique and interesting things in your holiday decor. My favorite is your husband’s pedal car. I used to collect them but sold them about 20 years ago. Now I wish I had them back! Off to check out the mystery home! Everything looks so beautiful! I can’t decide what I like best – the stockings, the trophies, the old shovel or the red car/firetruck! That. Was. Amazing! So many things, these tours always overwhelm me in such a good way! Your vintage ornaments on your branch valance was the sweetest thing ever! How is it that I am just finding your blog? Lovely pics and I think we are kindred spirits…we love the same things! I just LOVE how you managed to use all your husband’s childhood items in your home. Your whole house is so charming! Everything is so unique and personal. I feel the love you have for decorating in all that your home shows. Your home is beautiful Kelly! Still no decorations yet at our house because of a week of stomach flu. My oldest, then me :(. These pictures inspire me to get in the holiday mood. Simply beautiful. It’s a real treat exploring the little details from each picture. Thanks for sharing! Girl! Shut up! This is over-the-top! What fantabulous ideas you have! I am inspired x a thousand! Crazy creative, Kelly ~ charm oozing in every inch! Kelly…your home is fabulously decorated…I love the vintage look and am so happy that your mother in law was a “saver”…. neither one of our parents were “savers” … the fire truck is so amazing… I remember my brother having that classic turquoise blue pedal car … I have saved many of my son’s toys … and now my granddaughter plays with them …. 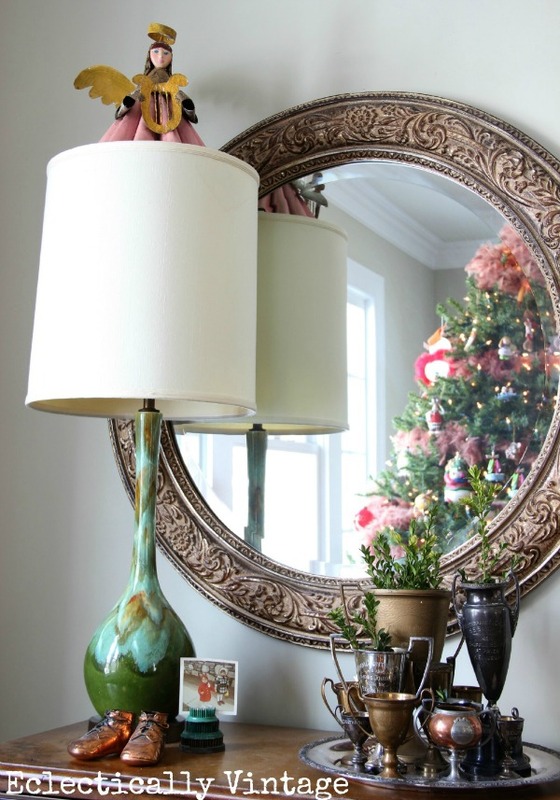 decorating with those items are just so wonderful … Loved the tour Kelly! Amazingly awesome. Every single thing. Oh, your home is just amazing! I love all of your sweet vintage Christmasing! Just a dream! Thank you so much for sharing. What beautiful details throughout your whole home! While all the homes are gorgeous, your vintage treasures strike a chord with me. Your MIL was a genius! I have a similar MIL and am thankful for all the things she saved. I LOVE car and shovel! The use of marshmallows is clever and new. Beautiful job! I’ll be back! What a gorgeous home tour. 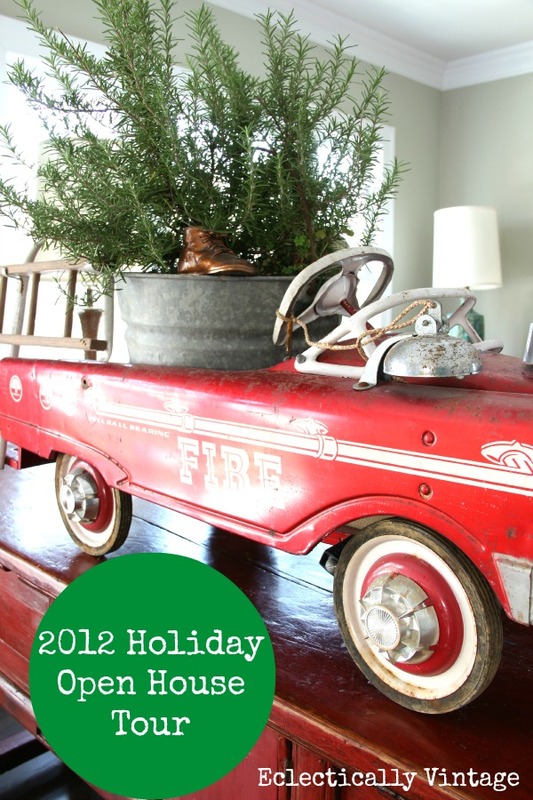 I have a similar fire truck and you have completely inspired me to use it in our home decor for the holidays. Your home is adorable! Love the vintage style decorations. I especially like the wooden “stockings”. 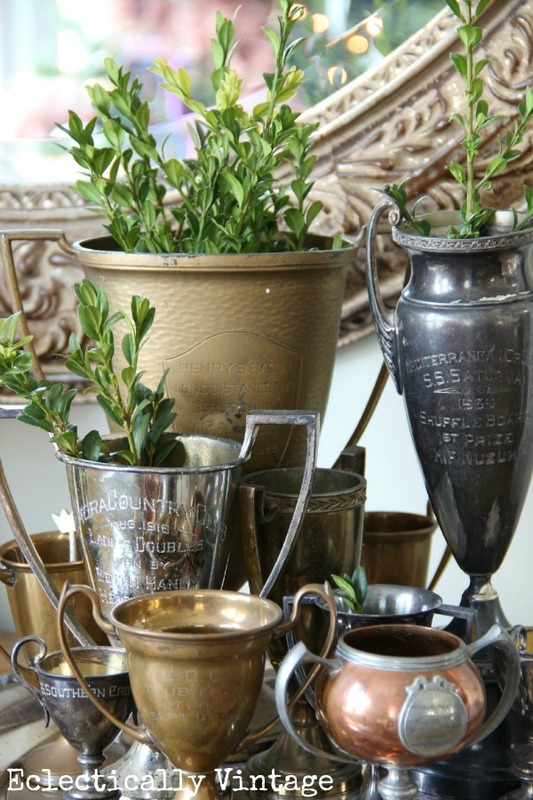 I was in Brimfield this past Fall and so loved all the treasures there. It was so much fun looking at all the vintage! You have done a wonderful job of decorating. Thank you so much for allowing us to tour. Kelly! What a beautiful post and house!!! I’m telling you girl! It you can make a little corner in the garage look as cute as the rest of the house..I’m renting it!!!! Big Hugs!!!! and enjoy the holiday season now that you are all done with the decorating! Wow, Kelly, your home is just non-stop charm and then some! You have so many wonderful treasures and just plain fun-things. Everything from that wonderful vintage child’s car, to the adorable stockings hanging from the banister, to your unique way of decorating your white tree — words escape me, except just to repeat — WOW! Wow what gorgeousness everywhere! I am most impressed with that shovel. What a great find!! Please tell me that you started doing all of this well before Thanksgiving…I started the day of, and have so little done…must get busy…must get busy. Awesome, just awesome! 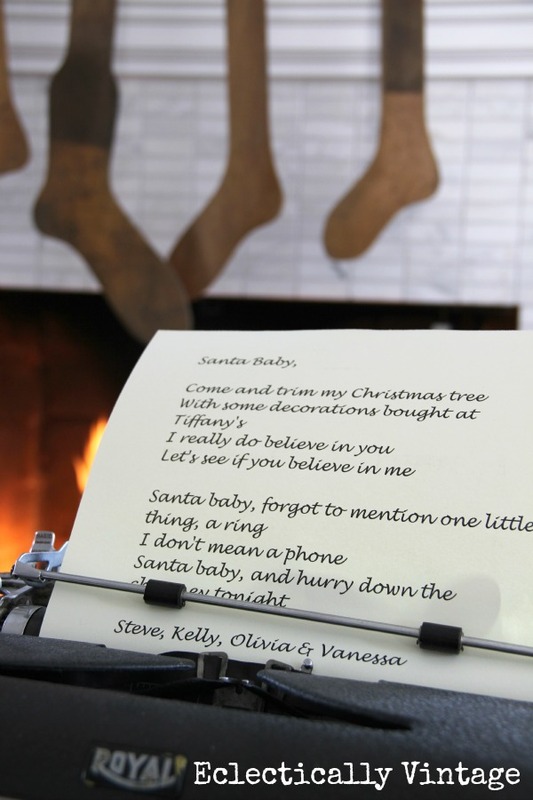 I am lvoving that typewriter photo with the santa baby letter. So pretty! 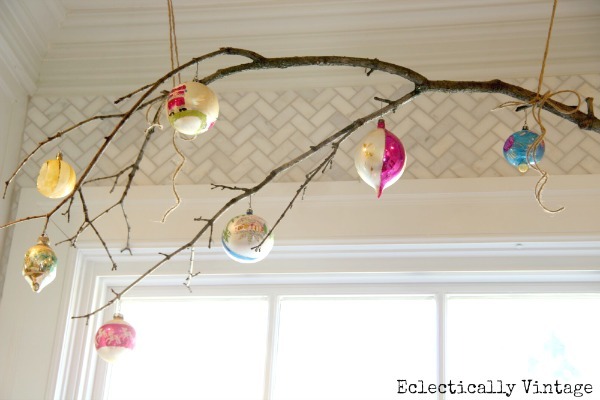 Found your site when looking for feather trees – LOVE your decorating sensibility!!! glad I found you site – I’ll be stopping by again! Hey, Kelly, your house looks so wonderful decked out for Christmas, love all those special vintage touches that you have created. That old car of your hubs is so cute. Love, love it all! oh Kelly!! you have fabulous taste and ideas!! just stunning!! So many wonderful, vintage touches, Kelly! Love your dress form and that little red firetruck. Wow! I also love the vintage shovel hanging on the door. You’ve got some great stuff! Thanks for sharing your home with us. Your home looks GORGEOUS, Kelly! Wow … everywhere I turn, something to ooohhh and aaahhh over! This is my second trip over and I’m still loving it!! Thanks for sharing with us! Kelly that shovel is drop dead amazing. It seams like all the people in my family (older) were always trying to get rid of everything. So annoying! I have to depend on Mike’s family for any good old stuff! 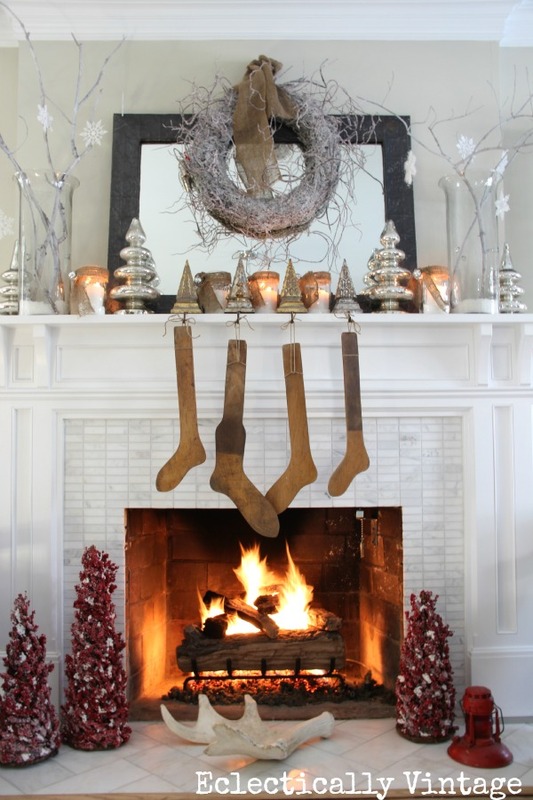 I LOVE the wooden stocking forms hanging on the mantle. Perfect! That was a fantastic tour. Surprises around every corner. So many things I’d like to pin directly from your site. 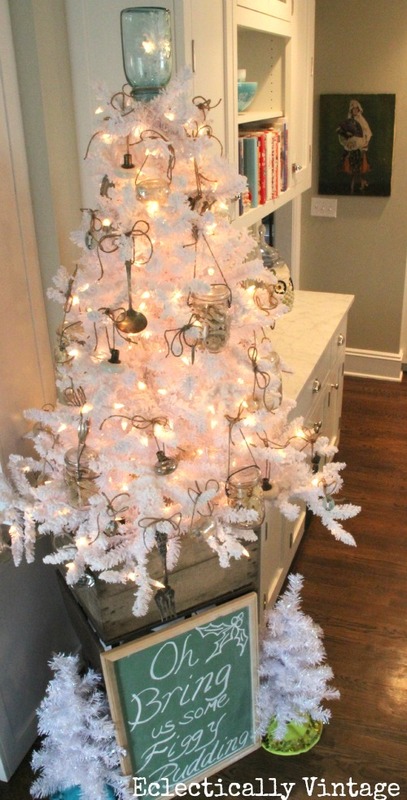 The old glass door knob hanging on the tree…brilliant, that little shovel….oh so sweet, feather boa garland….love it all. And, very cool that your mother-in-law saved those treasures. 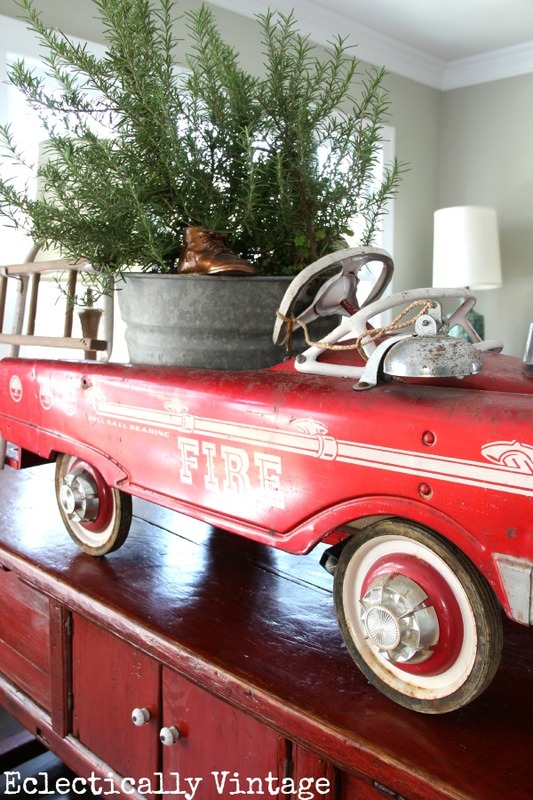 I LOVE the vintage fire truck, so cute!!!!! 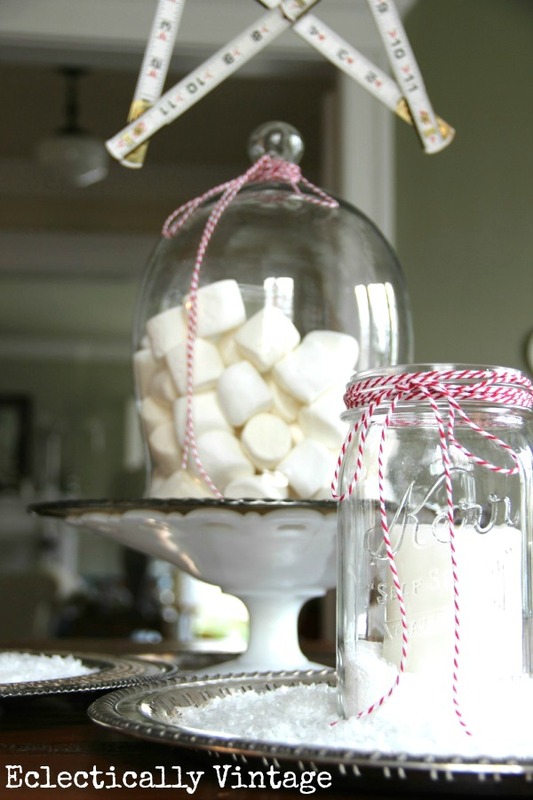 Kelly, you definitely have a cute collection of vintage items and have incorporated it with fun into your decor. Your fire truck makes me miss the one I sold a long time ago! Happy Holidays! 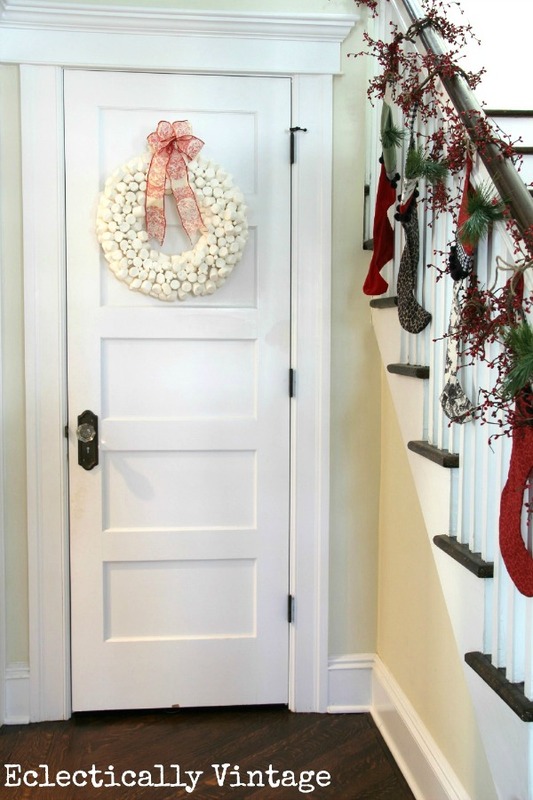 Just phenomenal, Kelly–your home is gorgeous for the holidays! 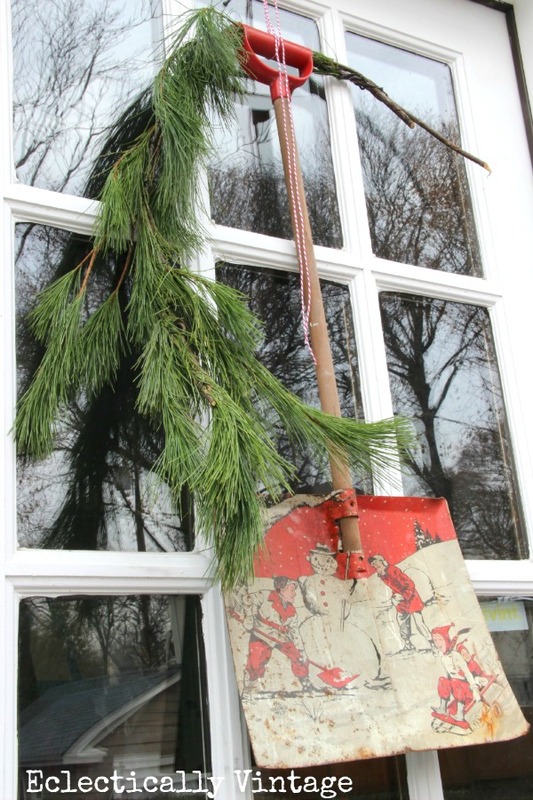 I love the vintage kid’s shovel of your husband’s–so cute! And the rocking horse and trophy cups with the boxwood and the sassy letter to santa–love that song with Eartha Kitt singing! I just love it ALL! 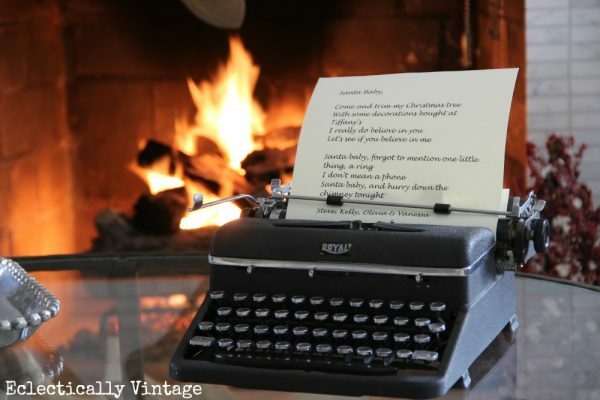 Love vintage, and you have done a wonderful job creating a vintage Christmas! The figgy pudding tree is my fav! Favorite stop on the tour! You bring the unexpected…and I’m cheering! Love love it all. My fav is the fire pedal car!!! My hubby is a fire chief and I just love that! I think that fire car needs to pedal over to my house!!! Everything is beautiful. Loving everything, but especially the vintage dress form with the ornaments hanging from it! So cool! Kelly everything is just amazing! It is so hard to pic a favorite but I would have to say the old firetruck and the typewriter! I must find me an old one for next Christmas. My boys would love it. Honored to have ya partying at my place lady! Hope your week is going well. I did so enjoy touring your beautiful and whimsical Christmas home. Everything looks perfect. We just brought my husband’s childhood snow shovel back from his parents’, but it doesn’t have that adorable vintage scene on it. Oh how I love that! Your home looks awesome! I love all the finds you scored at grandma’s attic! That car and shovel are amazing, and the fact that they were your husbands make them even more special! I love all the details throughout the house, it says creative and fun, just like you! Kelly! Your home is always decorated beautifully. I love the clever and imaginative ideas that you come up with! Love the fire engine too. Your brain is constantly spinning with new ideas for old vintage items and that’s why I come here for inspiration. Your style rocks! 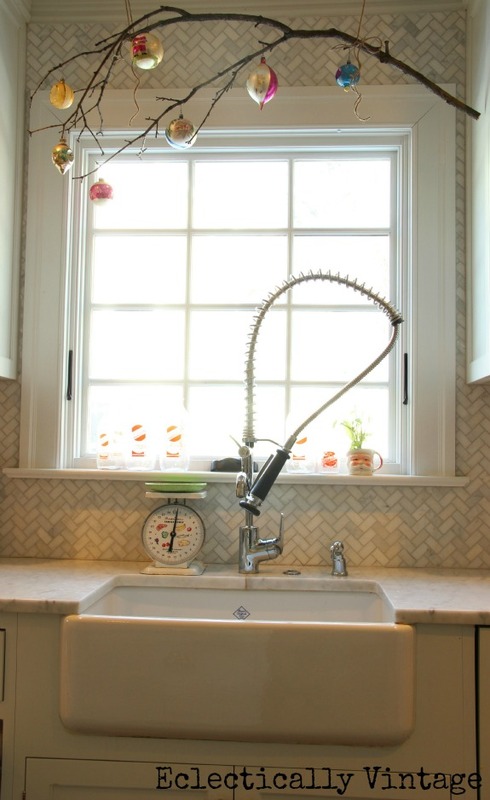 Love all the little details, especially the display over your kitchen window! Beautiful! So lovely, Kelly! I love it all! Wow! You are so talented. I love all of your Christmas decorating. Your site is on the top of my list as favorites. I always make sure I check out what you have for us. Merry Christmas! I really love the personal connection to the fire truck toy car and the vintage shovel! I was recently thinking how I need to take my vintage typewriter out of the closet. Your Letter to Santa is brilliant. Kelly your home is amazing! I love the little car and the tree is gorgeous! My favorite is the shovel, that is a treasure! 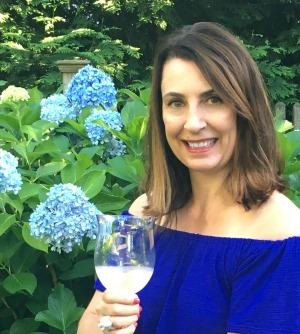 Kelly your home and your blog looks beautiful! I am especially taking inspiration from your stairs. I just got mine refinished and they look very much like yours… looking forward to decorating them. Thanks so much Susan! I know you will decorate them amazingly! You had me at those antique stocking stretchers. I gotta find some now?? Thanks Ann and good luck in your search!